This brownie recipe is so simple (ONE pot!) 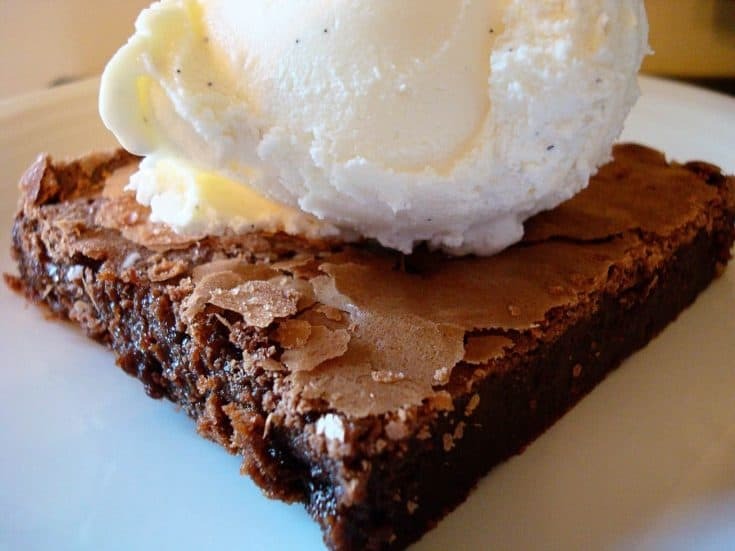 and so delicious, it is definitely classified as one of my ultimate go-to brownie recipes. I have made it dozens and dozens of times and it is unbeatable when topped with ice cream. 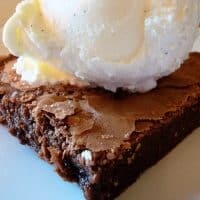 I have many favorite brownie recipes (how can you choose just one?) but this is definitely in the top faves. Every brownie is different and every brownie lover has their ultimate brownie – these beauties are fudgey and moist. Since they are made with chocolate chips as the base, you can tailor the flavor to your liking – if you prefer dark chocolate, then by all means use dark chocolate or semi-sweet chips, but if you like a more mild chocolate flavor, pour in milk chocolate chips. Preheat oven to 350 degrees. In a medium saucepan over low heat, melt butter and chocolate chips. Stir constantly and remove from heat when chips are fully melted. In the same pot, blend in the sugar and vanilla. Then add eggs, blending fully one at a time. Add flour and salt and beat until air bubbles form in the batter. Pour into a greased 9 X 13-inch pan (this recipe works great doubled and poured into a large 11 X 17-inch rimmed baking sheet). Bake for 20 minutes. Turn heat down to 325 degrees and bake for 10 more minutes. Delicious! Just made them, they were so easy and so good! These were the first brownies I’ve ever made, and they turned out wonderful! I just had to make these, so yummy. Erin – I’m glad your first try at homemade brownies worked out so well! Do you think this would work in a 8×8 pan? Please let me know what you think! I have tried several recipes off your site and all are outstanding! Thank you so much! I am glad to find a site that has great taste! Hi Liz – the recipe as written would make too much batter for an 8X8 pan. Perhaps if you halved the recipe, you could use a smaller pan. I’ve never tried it that way but am guessing it could work. So easy and soooo good! We all loved these! I have tried several brownie recipes and they were never better than the boxed ones. Thanks to you no more boxed mixes for me! Katie – that’s high praise to beat out a boxed mix. Thanks! Nicole – thanks for the tip on the 1/2 whole wheat flour. I’d like to think my family would be some of the ones who would like them anyway but chances are they would be able to tell. I’m still going to try it, though! Just made these and blogged about them on my blog today. They are now my official go to brownie recipe. Thank you Melanie for another keeper. I so love your blog! Those brownies sound like my perfect brownie! I’m marking these to try. This looks soooo good! Thanks for the great recipe! YYYYYEEEEAAAAHHHHHHHH!!!!! My David has been asking for brownies forever and these look awesome (so simple, one pan and oh yeah chocolate!!). Thank you, thank you and David thanks you too. I’ll make them tomorrow. Hi Maris – thanks for looking for my blog and letting me know you like it! That means a lot to me. And I agree with the “easiest” recipes – I’m always looking for those! These were easy, a little involved, but still easy, which is all that is important to me. They are verrrry delish, though mine seem to have come out much thicker than yours. I’m wondering if i did something wrong? Still tastey though!By the way, this is Allyson, Dixie’s sister. And i tried the sweet and sour chicken, it was a real winner! Thanks for having this fun site. OH YUM! Who doesn’t love an easy brownie recipe? Especially one that looks this good AND with ice cream! Mmm……. Darrin and Britta – wow, I feel honored to see your comments popping up on the recipes you have tried. Thank you so, so much for checking back in and letting me know they have turned out for you! I appreciate it. Your comments have made my day! Brownies are my favorite! I will have to try this easy one pot version! I am sure I will be in heaven! Loved these! I made them for an after school snack and my boys have inhaled them. Thank you! Just wondering on the part about blending in the sugar & flour– use a wooden spoon? or a whisk? or elecrtic mixer?I want to try these, as 12 oz of chocolate HAS to make a good pan of brownies! Fudgy and moist is how I like them! These sound so delicious – and so easy!! Fish on the Wall – in answer to your question, I always use a stainless steel pan (instead of one with a nonstick coating) and then use my handheld mixer to blend in the rest of the ingredients to the melted chocolate and butter. Let me know if you have any other questions! I am gonna have to try these. Brownies are one of my hubby’s favorite’s. Plus I just stocked up on choco chips at Albertson’s for 70 cents a bag. After all of the intense brownies I have been baking, these look really appealing and easy. They look really good. Thanks for coming by my blog! And yet another great recipe! This made my cravings rev up into high gear. yummmmm!Thanks for the comment. I love looking on your site for recipes. I obviously haven’t gotten as far as you though. Oh goodness, these are insanely delicious! I’ve been making a few things from your blog this last week, and they just turn out so perfectly! My workplace is getting a bit spoiled with all these goodies : ) Thank you!! I’m loving how easy they look! My hubby loves brownies and so I’ll definitely have to try these! I love it. Sometimes you just need something simple, and the long, complicated recipes aren’t always necessarily better anyways! Allyson – hey, stranger! It’s been at least a million years since I’ve seen you and it was fun to get your comment. Glad you liked these – and on the thickness…I wonder if that would be an altitude thing since you live down south and I’m up north. Not sure but if they still tasted great, I’m glad! I love ANY and ALL brownies! Mmm these sound really simple and they look delicious! I am excited to try them! I love that the base is melted chocolate chips –yum!